You live in Eden. You are a member of the Family, one of 532 descendants of two marooned explorers. You huddle, slowly starving, beneath the light and warmth of geothermal trees, confined to one barely habitable valley of a startlingly alien, sunless world. After 163 years and six generations of incestuous inbreeding, the Family is riddled with deformity and feeblemindedness. Your culture is a infantile stew of half-remembered fact and devolved ritual that stifles innovation and punishes independent thought. See what I mean? quite powerful stuff in my reckoning - and that is the very least of the story, in Dark Eden we are treated to an incredibly rich and complete world full of characters that come alive amidst the pages of the book, a lost people forced to survive on their own and isolated from any other humankind on a truly alien world, a society that has evolved from just two survivors of a space ship crash landing. The narrative is written in the first person from a few different perspectives and as such is told in a post-human dialect that really draws you in to this little world and encourages you to think a bit more about what the characters are really saying. You can see that a huge amount of thought has gone into just how such a society could survive and it really does show, at no point was my sense of belief questioned. The quality of the writing is superb while the authors' clear voice shines brightly from the pages. It's very much a literary work that uses the science fiction setting as a vehicle to explore the many ideas presented here. On the surface there is the human urge for survival, the devolutionary and self destructive effect that a limited gene-pool and incestuous in-breeding has, the evolution of language and the dangers of dogmatically sticking to ritual and tradition rather than thinking about how things could be done differently, or more effectively (amongst others). Look beneath the surface though and the author is commenting on society itself and how one dangerous idea can change the world, an allusion to the age old story of Eden and original sin; but reversed. I loved how complete this book feels, the sense of immersion is excellent, in part due to the incredibly detailed and vivid alien world which is described in excellent yet very concise detail. There are many parallels to the plants and animals of Earth - or at least things that have been named for sharing some external similarities. Each and everyone are quite different, fitting neatly into this truly alien vista with geothermal trees that bring light and warmth to a planet that seems to be without a nearby star (or at least landlocked away from one) and animals that project their own source of light. 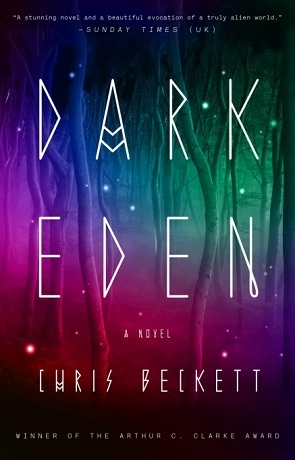 Dark Eden is an incredible novel, a literary tour-de-force that succeeds on every level, highly recommended. Written on 14th April 2014 by Ant.